The U.S. bank prime rate continued at 3.25 percent in early June. 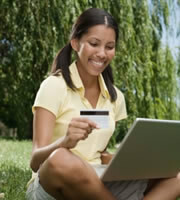 All the credit card offers tracked by the IndexCreditCards.com survey were also unchanged. Economic momentum seems to have stalled. Bond yields rose throughout May as there were indications that the economy might be getting stronger, but more recently this optimism has started to wane. The Bureau of Labor Statistics (BLS) employment report for May, which was released in the first week of June, is a good example of why the economy seems stuck in neutral. The BLS reported that a net total of 175,000 new jobs were created in May. Since this almost exactly matches the average of 172,000 new jobs for the prior twelve months, it suggests that while growth continues, it is not gaining any momentum. Credit card rates never joined the low interest rate craze. While many other types of interest rates, such as those on mortgages and savings accounts, fell sharply in the aftermath of the Great Recession, credit card companies were more cautious about lowering their rates. According to the Federal Reserve, average credit card rates have dropped by just 56 basis points since 2008. Since credit card rates did not fall as far in response to economic weakness, it makes sense that they may not rise as much when the economy improves. Credit card rates may remained unchanged until there is more conclusive economic evidence, but even then those rates have a sufficient cushion to not be as economically sensitive as some other types of interest rates. With both categories of consumer credit card offers remaining unchanged, the spread between average rates for rewards and non-rewards programs remained at 2.47 percent. This represents the extra price that consumers must pay, on average, for participation in rewards programs - but only if they do not pay their account balances off in full at the end of each billing cycle. Student credit card rates remained unchanged at 17.42 percent, but students should be aware that even if the overall rate structure of credit cards remained unchanged, individual customers can still experience changes in the rates they are charged. This would be due to any changes in the credit standing of those customers, which is why it is always important to maintain good financial habits, such as paying bills on time and not running up large amounts of debt. As was the case with consumer credit cards, the lack of change in both categories of business credit cards left the spread between business rewards and non-rewards programs unchanged. In the case of business credit cards though, this spread is substantially lower than for consumer credit cards, and currently stands at 0.76 percent. Because there was no change in any of the rate tiers offered by the credit cards in this survey, the spread between rates for customers with excellent credit and those with average credit remained unchanged at 4.10 percent. This spread represents the extra price that consumers must pay on their credit balances if they have not maintained their credit histories at the highest level of quality. 0 Responses to "Credit card rates hold the line"